Hey...it's Renee over at the Science School Yard where I teach 400 kindergarten through fifth graders science each week! I was asked last week what type of activities can I do quickly in my classroom with no supply budget that will actually teach a quick science concept when students are getting antsy for a break. Time For Ice Fishing and Magnetism! Seeing that winter is almost here, and a break is in sight here in the US let's take a look at some primary and intermediate ideas that won't break the bank unlike our Christmas shopping list! -Grab the book Snowflake Bentley and catch snowflakes outside on black paper, then come inside for a lesson on snowflakes followed up with making cutout snowflakes. (No snowflakes? Make them and hang them first! Here is a great video to share as well..
Did you make snowflakes? Place a poem in the center or quick science facts they learned and you have tied in a writing lesson, too! -Time to talk hibernation and migration! Lots of animals are getting ready for a long rest. Make a list of animals that might hibernate...ground hogs, bears, snakes... you can also grab a quick pack that will help you teach each part of STEM as well! 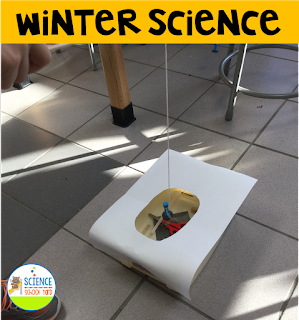 Find a STEM Hibernation Pack HERE! Building a habitat for an animal to hibernate is can be as simple as getting 10's and 100's blocks out! Technology connections with smartboard or iPad activities! Tie in some math and you are set for a great hibernation station! -Do you have some Hot Wheels or toy cars? Grab some boxes found around school, cut them into pieces to make some ramps, grab some dictionaries from the school library, and you have a lesson on force and motion! Predict what might happen if we make ramps that are steep or not as steep. Test how far a car will travel down a ramp. A tip with littles, if you have tiles...count the number of tiles it went. Then add another book, predict...will the car go farther or not as far? 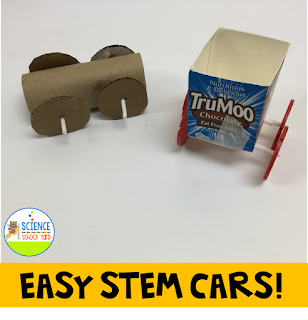 A great STEM connection...have them make their own cars out of milk cartons from lunch, straws from the lunchroom or dollar stores and tape. (You will need to make sure it rolls by creating an axle which could be one big straw outside a smaller straw taped to the bottom of your carton...don't forget the wheels!) Cut wheels out of boxes and you have a cheap way to add a force and motion lesson...or two! Make connections with a great book like Sheep In A Jeep or a great video with lots of easy facts! A quick video on what ramps are helps them visually learn about simple machines, too! It sure makes work easier! Back to force and motion...I even taped paper together with the colors of the rainbow and taught them force and motion through a fun and interactive race! They pick a color out of the bucket and then have to push their car to that color...the closest car wins. Did you have to push it soft or hard? Was it close or far? Again...a quick and cheap lesson on motion and positional words! -What would we do without water? There are lots of different activities that you can do to learn about it! Surface tension and how many drops can sit on a penny! What do you need? Droppers, pennies, and water. Try salt water and soapy water, too. Want more water ideas? Try surface tension and how water acts on different surfaces. Try what water drops do on paper towel, wax paper, white paper, foil...whatever you have laying around your kitchen or at school. Try a water bead race after making a track on paper. Can they get a bead to follow a path on wax paper? A fun follow up on what a bead of water does on different surfaces! There are some great books out there so give Scholastic's Book list a try! -Let's look at those Hot Wheels! 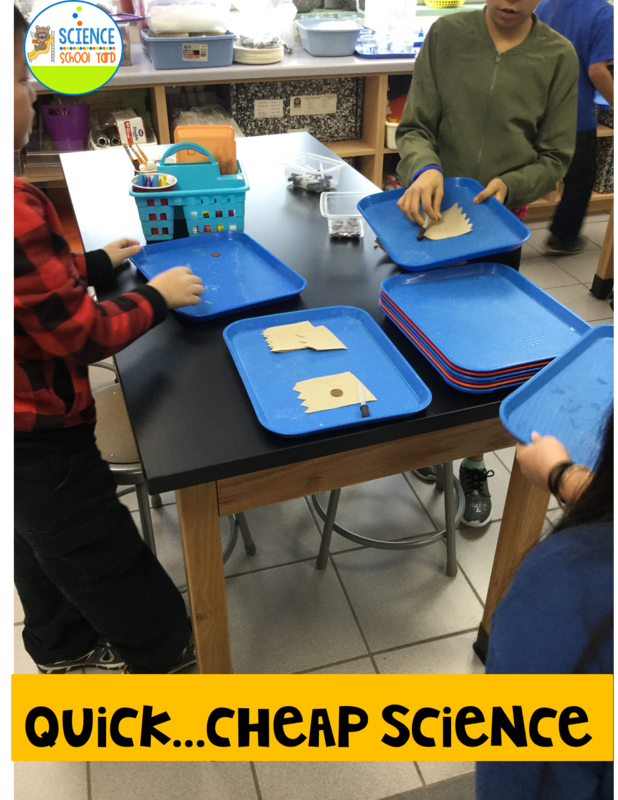 The fourth grade NGSS Energy Standard has students looking at energy in motion and what happens when objects collide or meet focusing on change of speed. Get those books and set up a way to create a slope with older students, but utilize the standards set for intermediate learners. The NGSS site is a great place to get ideas, here is a great start! How can you tie the standards to a quick energy lesson? If you have cups and string, can you add a sound lesson and make telephones to show how energy is transferred through solids? Could you use flashlights to test how light travels through a glass of water, on a wall when your close and far away? How does this relate to stars in the sky and how distance can cause a star to look bright or dim? -Use a hanger if you don't have a scale. Place baggies with objects in them to weigh different items. Show that air has weight by having air in one baggie and a flattened baggie on the other end. You can teach the three states of matter. Show ice, water, and steam from a coffee maker. Go on a matter hunt in magazines and make posters. Easily, you can make pancakes which also shows all three states of matter! Mix=solid, Water=liquid, Steam=gas. You can even tie in that it was a liquid, but now a solid! A cheap treat and a science lesson! -Finally, salt as well as sugar can be a great way to teach solubility by testing which one can dissolve more in water? Sugar is more soluble! Can you place the liquids in lids and evaporate the liquid off? Take a look a the crystals! Observe what is left behind. Older students love snow flakes crystals, too! Snowflake Bentley...here we come! It is never easy balancing everything you need to teach in a given day...from reading, to math...from writing to science, with a mix of some social studies, how can we make it a bit easier? I will always say integrate when you can. Grab that picture book or non-fiction resource and take a look at the science standards you need to be using...take a look at school for free or inexpensive options. Add written observations, a story, or even a poem and you tied in literacy and writing! Another great strategy for your supply list... I love putting a donation box outside my classroom with a list of needs. I get egg cartons, toilet paper tubes, and an occasional ball of yarn and even some surprises at times. (a parent donated sparkly silver paper!) When you are creative and resourceful, you can make it work! If you need a bit of guidance...the http://www.scienceschoolyard.com/ is ready to help you make science child's play!